I think one of the best parts of living in Ohio is the changing seasons. Winter to Spring, Spring to Summer and my favorite, Summer to FALL! I love the cooler, crisp days when the sun is still shining bright and warm and of course the way the leaves turn brilliant shades of orange and red. I've got to give credit where credit is due, our creator God out decorates me every time! I feel so blessed to enjoy His beautiful artwork and have a fun time enhancing its beauty! I was lucky enough for this vignette to start with a great anchoring piece in a vintage, wooden cart with metal caster wheels. My hubby found this piece and had it delivered to our house one afternoon and I was thrilled! He had described it to me over the phone and I knew right away what it was. My first thought was "I'm getting a new coffee table! ", however when it was dropped off in my garage I realized right away it was much bigger than I imagined! It was also covered in orange spray paint in spots. For now, it's perfect as the base of my front door fall decor! I gathered some other antique finds like the galvanized metal bucket as well as the old metal gate and got to work! (I'm pretty sure at this point my neighbors thought I was starting a junk yard at my front door!) I had an old wooden cable spool that worked well in hoisting that beautiful white pumpkin up a bit for better display! 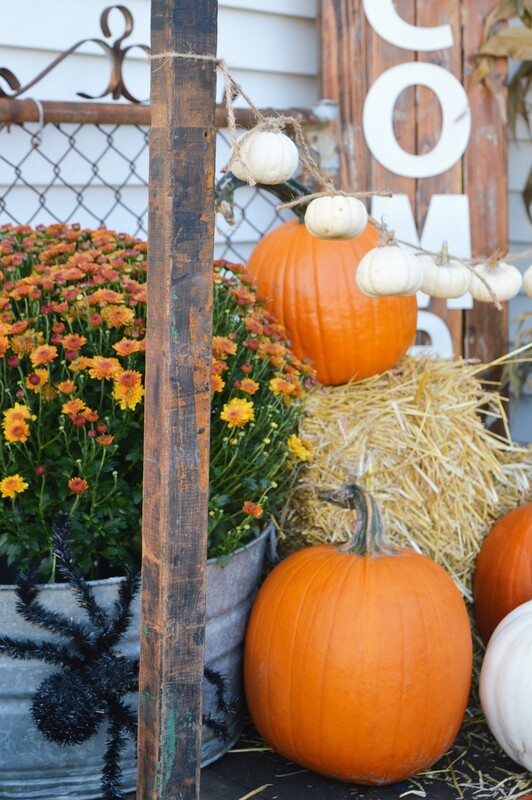 Other natural elements used were some hay bales and dried corn stalk with of course pumpkins and mums! Can't do fall with out those! Living in Ohio also has its perks like driving down the road a bit to the local farm to pic up those hay bales, corn stalks, pumpkins and mums. Had I been able to even remotely lift it, this baby would have come home with us! Maybe it's too much?!?! So we didn't bring that one home, but the others were fun to pick out and when we get closer to Trick Or Treat night, my kiddos will have fun carving them! There are two wooden posts on either end of the cart and I pictured a gun garland hanging between them. We do not have a covered porch area, so I knew it needed to be something that could withstand the elements for 6-8 weeks. Mini boo's or tiny white pumpkins to the rescue! I simply tied twine to each stem and secured it with a dab of hot glue so they didn't come untied. Front there I hung a line of twine from post to post, and tied the pumpkins, evenly spaced, across that line. The weight of the pumpkins gave a perfect, natural bow and I must say, it's my favorite part! I'm heading back today to get me more mini boo's so I can make another one indoors! Another DIY addition was the large, wooden "Welcome" sign. I have seen these via Pinterest as well as Instagram, some were also DIY'd and some had been purchased, I wanted one! I used leftover 2x4's in my garage and letters purchased at the craft store to make this and I love the over 6ft tall size! It's a great statement piece for the front door. I did a short tutorial here, if your interested! We don't go crazy with spooky, Halloween decorations, but I added these fun black spiders to the mix for just a hint! All in all I'm so pleased with this little welcoming spot at our front door, and I hope my neighbors no longer see it as a junk yard!